This year 2017 is an awesome one, among alltelcos, MTN is the first to be dashing out whooping 4GB of data to their loyal subscribers just like that. I don’t know if this is for everybody but definitely it is new year gift. 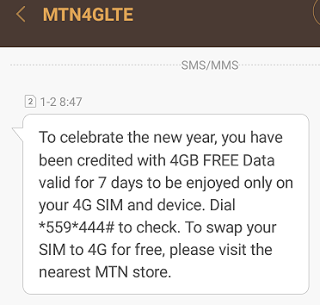 “to celebrate the new year, you have been credited with 4GB Free Data Valid for 7 days to be enjoyed only on 4G enabled devices”. To enjoy this also, just Dial *559*444# to check your free 4GB data.